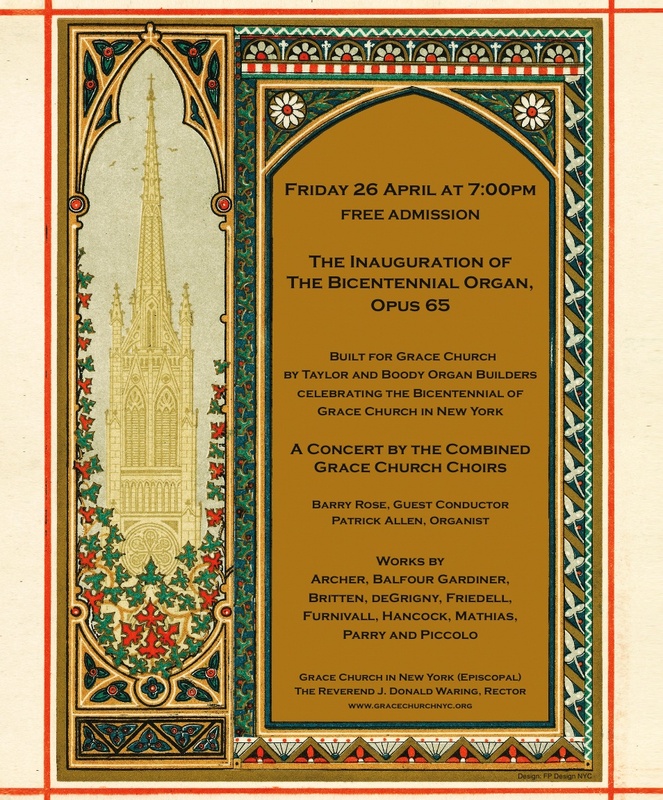 The Inauguration of The Bicentennial Organ, Opus 65 will take place on Friday evening 26 April at 7:00 p.m. The Combined Choirs of Grace Church will offer a special concert of anthems and hymns conducted by our long time friend Dr. Barry Rose. Patrick Allen will be at the organ. The Concert is Free, bring your family and friends and plan to enjoy this very special evening of sacred song accompanied by the new organ! LET MUSIC BE THE FOOD OF LOVE, PLAY (SING) ON! This is our musical banner going forward. We invite everyone who attends this, the first of many programs to celebrate this new voice in our community, to bring a dry good and help feed the hungry of our City. Music by Archer, Balfour Gardiner, Britten, deGrigny, Friedell, Furnivall, Hancock, Mathias, Parry and Piccolo will be featured.